Obama’s nominee for Treasury Secretary has spent the better part of four decades going back and forth through the revolving door from Washington to Wall Street. Which side is he on? 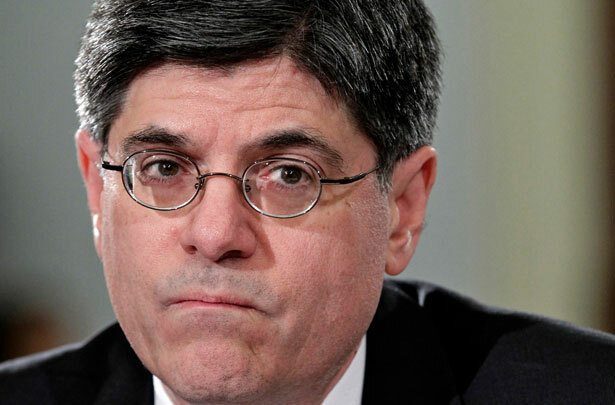 How do we reconcile the contradictions that are inherent in Jack Lew? He's the Carleton College student whose faculty adviser was Professor Paul Wellstone and the Clinton aide who promoted trade agreements and budget policies that Senator Paul Wellstone opposed; the former aide to populist Massachusetts Congressmen Joe Moakley and Tip O’Neill who made at least $1.1. million a year as a managing director of Citigroup; and now, the man President Obama has nominated to replace Tim Geithner as Secretary of the Treasury. There’s something to the GOP gripe: Back in 2008 and 2009, Lew fought for a big stimulus plan, and he’s got a track record of defending Social Security, Medicare and Medicaid that goes back to the 1980s. How many Democrats will join Sanders? That will be determined by the quality of questioning Lew faces, and the quality of the nominee’s responses. Progressive Democrats, who have been justifiably frustrated with the defining role that Wall Street–aligned Clintonites have played in setting—or is it “warping”—Obama administration economic policies, do the president no favors by simply rubber-stamping Lew. The nominee must make a case for Senate approval of his nomination. Republicans will ask plenty of tough questions. Democrats should as well. 1. You were a special assistant to Bill Clinton when he worked with Newt Gingrich to pass the North American Free Trade Agreement and the General Agreement on Tariffs and Trade. Your former professor Paul Wellstone opposed both agreements as a US senator, arguing that they undermined jobs, labor standards, environmental protections and democracy. Who was right? Clinton or Wellstone? 2. As Treasury secretary, you will have a big role to play in international wrangling over trade policies and complaints about Chinese currency manipulation. We’ve got record trade deficits with China and there are estimates that trade policies have cost as many as 2.8 million American jobs. Do you think that successive US administrations, several of which you have served, have been too lax when it comes to international economic relations? What have you learned from your experience of two decades as an advocate for free-trade agreements? Does the United States need to get tougher with its trading partners? Do you have any objections to Ohio Senator Sherrod Brown’s Currency Exchange Rate Oversight Reform Act? 3. You served as head of Bill Clinton’s Office of Management and Budget when he was working with a Republican Congress to undermine the Glass-Steagall Act and to enact the Wall Street–friendly Financial Services Modernization Act of 1999 and the Commodity Futures Modernization Act. Progressives opposed these initiatives, warning that they erred too far on the side of deregulation. Wellstone warned that “Glass-Steagall was intended to protect our financial system by insulating commercial banking from other forms of risk. It was one of several stabilizers designed to keep a similar tragedy from recurring. Now Congress is about to repeal that economic stabilizer without putting any comparable safeguard in its place.” Did you share any of those concerns or were you all on board with the deregulation push? 4. Former North Dakota Senator Byron Dorgan said during the 1999 Glass-Steagall debate: “I think we will look back in 10 years’ time and say we should not have done this but we did because we forgot the lessons of the past, and that that which is true in the 1930’s is true in 2010.” In hindsight, considering the banking meltdown and all the economic pain that followed upon it, do you think that Dorgan might have been on to something? 5. In October 2008, presidential candidate Barack Obama said: “We know that it’s because of deregulation that Wall Street was able to engage in the kind of irresponsible actions that have caused this financial crisis.” In September 2010, you told the Senate Budget Committee, “The problems in the financial industry preceded deregulation.” With regard to the financial-services industry meltdown of 2008, you said that “I don’t believe that deregulation was the proximate cause.” Who was right? Barack Obama or you? 7. During George W. Bush’s presidency, you served as a managing director of CitiGroup, which paid you more than $1 million a year and gave you a $945,000 bonus just days before you joined the Obama administration (as a State Department appointee) in 2009. Is it wise to put a former banker in charge of a cabinet agency that has quite a significant role to play in debates about how the federal government might regulate, and more generally relate to, banks that are sometimes referred to as “too-big-to-fail”? As Treasury Secretary, you will head the Financial Services Oversight Council, a Dodd-Frank Wall Street Reform and Consumer Protection Act creation that has the power to “resolve”—i.e., dissolve—“financially-dangerous” institutions such as “too-big-to-fail” banks. Watchdog groups such as Public Citizen worry that you retain “deep Wall Street connections.” Would your ties to Citigroup prevent you from dissolving Citigroup and/or similarly large financial institutions if they posed a threat to the US economy? 8. It has been reported that, while at CitiGroup, you oversaw a “unit that profited off the housing collapse and financial crisis by investing in a hedge fund king who correctly predicted the eventual sub-prime meltdown and now finds himself involved in the center of the US government’s fraud case against Goldman Sachs.” Should we be concerned about that? In hindsight, do you think your actions were appropriate? And can you assure the American people that, after your government service, you will not go back through the revolving door to work for CitiGroup or some other big bank? 9. During the transition period between the George W. Bush and Barack Obama presidencies, you are broadly credited with helping to define the scope and character of the new president’s stimulus legislation. Was the stimulus sufficient? Should we invest in additional stimulus spending? 10. Do you believe that investing in job-creation initiatives, and other steps that grow the economy, should be central to any deficit-reduction strategy? Many European countries have focused on deficit reduction as the highest priority, implementing harsh austerity programs that accept high unemployment and deep cuts in social services as a necessary consequence of budget balancing. Many Republicans in Congress claim to embrace this approach, arguing that nothing is more important that addressing deficits and debts. What’s your take on austerity? 11. Eleven European countries, close allies and frequent economic partners of the United States, are in the process of developing and implementing financial transaction taxes. These “Robin Hood” initiatives—which impose small taxes on trades and speculation—are designed not just to raise revenues but to control against aggressive and irresponsible speculation. Your predecessor, Timothy Geithner, resisted them. Was he wrong? Should the United States implement a “Robin Hood Tax,” as recommended by unions such as National Nurses United and Congressman Keith Ellison (D-MN)? 12. You have spent a lifetime moving between government and Wall Street. You have seen the intersect of money and politics. You have seen how corporations can influence the governing process. Do you think big banks and corporations have too much influence over our politics and our government? The president has suggested that it is time to consider amending the Constitution to limit the ability of banks and corporations to buy elections and define the regulatory agenda. Is he right? For more skeletons in the closets of Obama's Cabinet nominees, read John Nichols's size-up of Chuck Hagel.